18 teams, from 9 Universities, came together for what turned out to be a highly competitive weekend. 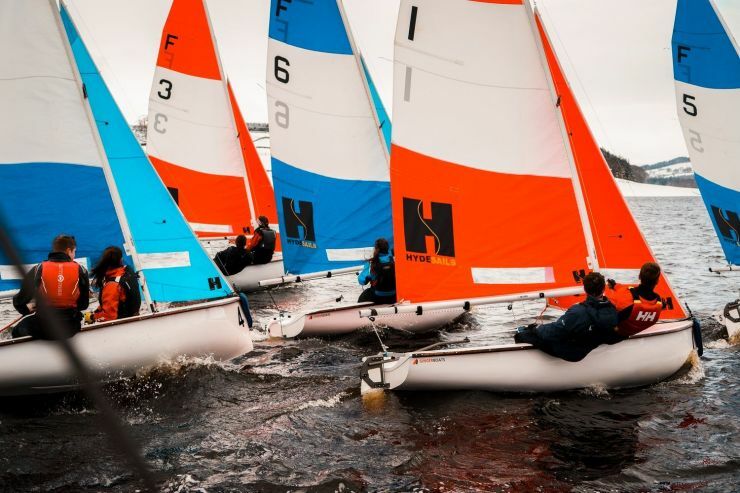 Racing got underway early on Saturday morning at a very snowy Derwent Reservoir. The wind remained consistent for the whole day, and with few incidents to hold up racing, PRO Sean Clarkson was able to run 72 races. Overnight, the results were very close, and a few races into day 2, there was a 6-way tie for first place. It was all still to play for! Day 2 was forecast to be much windier, so the decision was made to rig the cut-downs. Even with this, there was still enough wind to blow a couple of less fortunate sailors over. However, with racing still running efficiently, we made it through a further 54 races, putting each team on 14 races. The results were still extremely close, with 4 teams contending for the final spot in the top 4; the remaining 3 now qualify for the National Playoffs. It was a great weekend of racing, made possible by the hard work of many. Special thanks go to Sean Clarkson and his team of umpires and to Keith Sammons from KSail, whose fantastic scheduling system and technical support throughout the event were essential to its success. And, finally, thanks to all of the helpers from Newcastle University Sailing Club who spent every daylight hour at the sailing club, rigging and derigging, running the racing and generally making everyone’s life a bit easier. For BUSA Northen Coordinator, George Hayes' Report, with a selecton of Henry Fenton's photgraphs.